While certain rifle cartridges have improved over the years, some were just born tough from the very beginning. Tula 124 grain 7.62 x 39 Hollow Point ammo is a tough as its Russian lineage suggests, and as affordable as some of the most competitive surplus anywhere in the world today. The 124gr hollow point copper plated rounds are exceptionally hard, and are capable of perforating mild steel targets within 100 yards. Oxide coated steel cased cartridges are both more affordable than brass, and provide certain benefits during inclimate weather conditions. 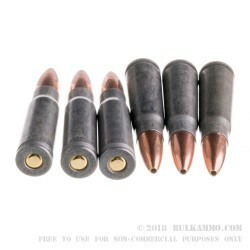 Due to the black oxide coating of the steel cartridges, the Tula 124gr 7.62 x 39mm Hollow Point is both highly water repellent, and resistant to both corrosive and oxidative forces that are common place in austere field conditions. Berdan style primers are non reloadable, however provide a non corrosive, hot ignition that is guaranteed to ignite on time and everytime. Perfect for outdoor training evolutions or hunting median sized game, the Tula 124gr 7.62 x 39mm Hollow Point is a well rounded ammunition suitable for even the most diverse of training needs. 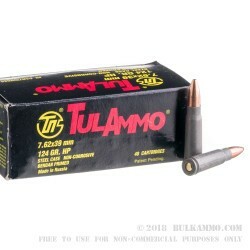 A: Hello Kevin, Tula ammunition is loaded in a polymer coated steel case.